I just watched this video on the revolving door between national "security" posts in government, and highly lucrative posts in the for-profit sector that contracts with said government officials to do their unconstitutional dragnet spying. Booz Allen Hamilton is, of course, just one of the many contractors feeding at the Pentagon trough. One remembers, for instance, DynCorp, which used taxpayer funds to hire underage dancing boys to entertain warlords in Afghanistan. Or Haliburton, which took taxpayer funds and failed to rebuild critical infrastructure in Iraq. I could keep going (Blackwater/Xe anyone?) but instead, I'd like to take a look at what we could have bought instead of all this corruption, graft and death-dealing. It appears that Congress is going to ignore the sequester and give the boys at the Pentagon even more money than the Obama administration asked for in its fiscal year 2014 budget request, but let's use that lowball figure for now until we know just how enormous the final Dept. of "Defense" tab will be for next year. 1 million military veterans could receive V.A. benefits. *114,761,359 households per the U.S. Census 2007-2011. Source: the very excellent federal budget website NationalPriorities.org, where Interactive Data-Trade Offs looks at spending by state or congressional district, and allows citizens to see how many human needs that money could be supporting. I view this information in light of news such as: Philadelphia is proposing to open its schools this fall so under-funded that parents are threatening a citywide boycott due to safety concerns. $50 million (instead of the $180 million barebones budget request) is all that is being offered for their K-12 education budget. 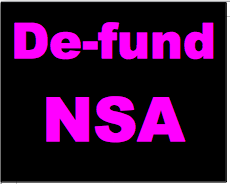 NSA snoopers, listen up: I WANT MY TAXES SPENT ON EDUCATION, NOT ON SPYING AND PEOPLE DYING. Upset yet? 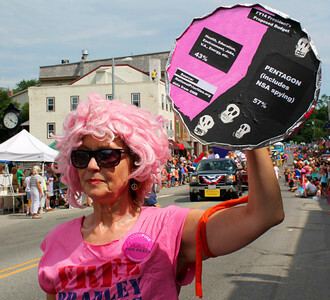 For action tools, visit CODEPINK's Bring Our War $$ Home campaign page. Join us in demanding that the federal government stop buying killing and spying, and start buying things people really want instead.